I compiled a list of players and picks that are either obvious assets for Botterill to use in trade talks, or names that I’ve seen mentioned by fans in various instances. Not all of these are even likely to be moved, but an attempt to compile a somewhat comprehensive list of assets that could be packaged or players who could be moved in order to create new opportunities for others. These are the most obvious and most valuable cards Botterill has to play. General draft pick value indicates that the Sharks pick isn’t a lock to become a difference maker. The Sabres and Blues picks look as if they’ll fall higher in the first round, making them a more attractive option for any team that ultimately acquires them. Buffalo’s recent play leads me to believe that their pick might be worth holding on to. A pick that they may even be able to package with something else to climb in the first round to ideally pick someone who might offer help at the NHL level sooner. It would be a disappointment to see Botterill make three selections in the first round this summer. Whether it’s ahead of the deadline or a draft day deal, I think it’s important that Botterill turns at least one of those picks into an NHL player who can step in immediately. Using two of these four picks is probably the combination I’d prefer to see. Ideally using their 2020 first as one of those two would allow Botterill to pick twice this year and ideally deal a pick that will be lower than theirs will be this summer. No matter what, you need to turn these picks into players with term. That may be Botterill’s biggest challenge as there are only so many players who can be wrestled free who have even one year left on their contracts beyond 2019. But to burn a first round pick on a player who will only be in blue and gold until July 1, 2019, that would be a mistake. Very few of these picks offer much of anything in terms of long-term value. Those two seconds provide some opportunity for cover in the Seattle expansion draft but a pick two drafts away needs to go to the right team to garner real value. They are worth noting as pot sweeteners for any deals that may come. Buffalo’s third this year could help bring in some short-term help as would next year’s second. These could be of particular use in finding a cheap deadline rental. Perhaps a center who slots in below the likes of Kevin Hayes in this year’s rental market. Nylander is probably the most contentious player in the eyes of the fanbase. He’s still struggling to find a consistent scoring touch at the AHL level but he’s still only 20 years old and you can’t take his draft status away from him. Somewhere there’s a GM willing to take a chance on a 20-year old, former first round pick. I’m on the fence when it comes to Nylander. At some point you need to see him to show something that shows he’s ready to take the next step of his career. And it gets late early in today’s NHL. Just how patient do you want to be? Former first round picks tend to garner a fair return when it comes to trades, meaning Nylander would be a good candidate to offer up to a team looking to retool or even in a hockey trade. Not dissimilar to the trade that saw the Sabres deal Zack Kassian for Cody Hodgson. Hopefully with a better outcome this time around. On the other hand, Nylander is still one of the most talented prospects the Sabres have at the moment. It’s hard to part ways with a player like that, especially if you think there’s an opportunity for him to step in and offer help to their top-nine as soon as the next few weeks. If there’s a blockbuster that requires you to include Nylander, it’s probably a deal you need to seriously consider. Guhle is stuck in a similar spot as Nylander at the moment. A logjam of veterans has left him stashed in the AHL and it may be weighing on him as his development hasn’t been as meteoric as it looked to be just a year or two ago. I think he still represents a great deal of value to the Sabres in the long term and may just be at the end of his rope in the AHL. It’s a tired trope but I’ll apply it here, I think Guhle’s game would level up given the chance to play with the big club. Still, he’s a tremendous skater and only 21. Every NHL team is in the market for a defenseman like that. He’d be a good candidate to strengthen a trade and with Lawrence PIlut’s emergence and Rasmus Dahlin making his expected impact, it might be easier to part ways with Guhle than it would’ve been just a year ago. Allow me to clarify that I don’t expect Samuelsson to be traded. He was selected by this regime and they’ll want to see how he develops. Especially considering their preference for collegiate prospects who can over-cook even before signing their first professional contract. That being said, a high second round pick would garner a fair bit of attention in a trade. 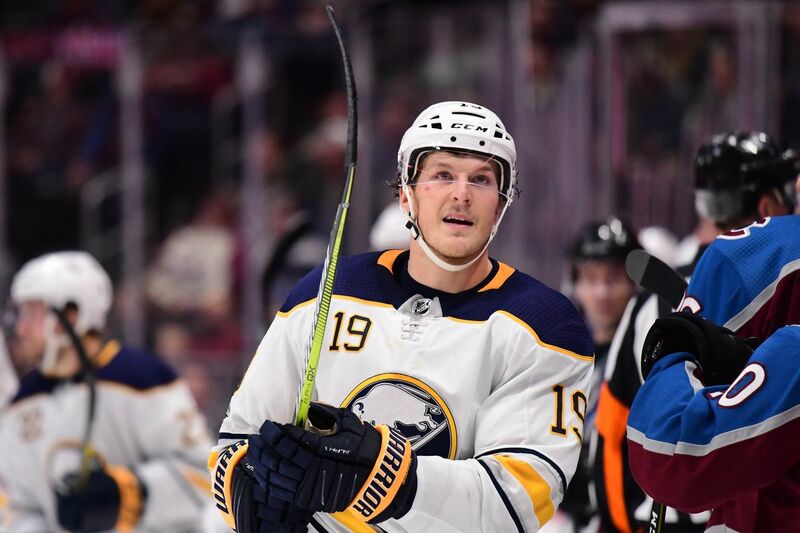 Like with Guhle, the emergence of Pilut and Dahlin gives the Sabres two quality pieces on the left side and the opportunity to use one of their left-handed defense prospects in a trade. Given Samuelsson is just one season removed from his draft would give the acquiring team that much more control. Both Samuelsson and Guhle strike me as perfect candidates to juice a trade to a team preparing to enter a rebuild. A club with quality talent that remains under contract but needing to trend younger. A defenseman factory like Anaheim comes to mind in this type of scenario. I only include Smith because he’s one of the few forwards in the pipeline with any sort of track record of success. It’s a shame he hasn’t gotten a longer look at the NHL level and he was signed by the previous GM so I suppose there’s some potential that he’d get moved, but I don’t see it. He’s nearly a point-per-game player in the AHL and one of the few players they can have some confidence in producing once he’s recalled for good. So he’s probably not going anywhere. 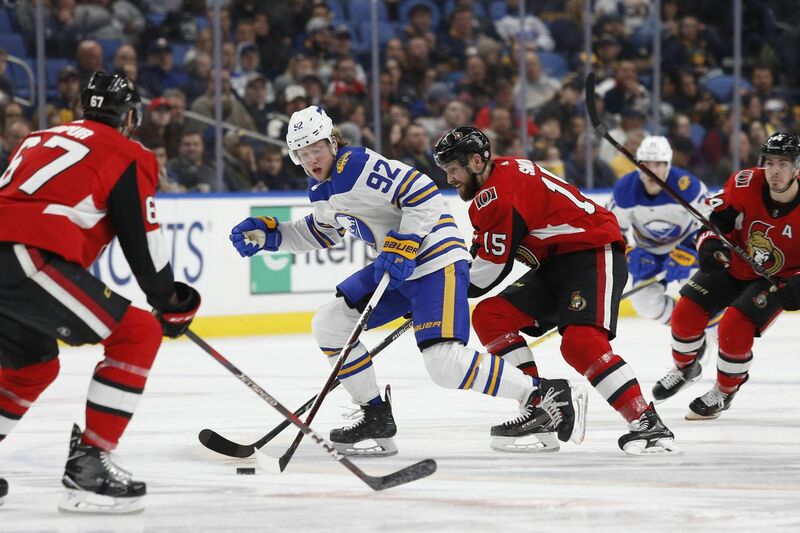 Asplund is in his first North American season and there hasn’t been a boatload of offense to show for it, but there’s still a lot to pick up from the former second rounder. As far as trade assets go, he’d be a worthy candidate to slide into a bigger package. Think Johan Larsson or JT Compher. You can run Asplund’s recap back for Davidsson just without the North American experience. He’s a Botterill pick, so like Samuelsson he’s probably got a little more protection than some other players in the system. Still worth mentioning as a potential chip. He’s the one player on the roster we know for certain is on the block as it’s been reported that he asked for a trade to a team where he can get more playing time. I think he gets a bad rap due to last year’s performance. But he’s been more than serviceable this season despite his limited playing time. I’m not confident that the Sabres can get the same value they paid last year, though the difference between a third round pick and a fourth is minimal. I’d prefer they explore moving another left hander (more on that later) before Beaulieu. But he’s not getting in the lineup and he’s the one most likely to be moved. It won’t be for much and maybe they can toss that pick into something else. But I’m not going to go overboard trying to read tea leaves on this one. Scandella makes $4 million per year and has another season left on his contract. Short of retaining salary and a drastic turnaround in play, Scandella isn’t going anywhere. But if there’s someone to cut bait with, he’s the one. Acquiring Scandella last year was a really smart bit of business by Botterill. He gave up two of the most popular pieces of dead weight on the roster and a mid-round selection to get an immediate upgrade to his blueline. It was a necessary addition and Scandella offered some steadiness last year. But his play this year has been nothing short of disastrous, yet he remains a lineup regular. It’s been frustrating to watch and unless some sort of perfect storm arises where a contender wants a veteran, stay-at-home guy, I just don’t see him moving. As much as the fanbase may want him to. Nelson shares some similarities with Beaulieu; buried on the depth chart with the added issue of an injury keeping him out of the lineup. He’s a nice depth piece who can probably be an effective bottom pair player for the Sabres in the long term. But there are other righties in the system who will be knocking on the door eventually. I think the numbers game will continue to work against him and he has a very team-friendly contract. If you’re in the market for adding a few more picks to the arsenal for future trades, Nelson might be another drop in the bucket. A lot of focus is being placed on the cadre of first round picks and the weakest portions of the roster. However, I think McCabe might be the player who offers Botterill the most flexibility. He’s young, on a cheap ticket with team control. He’s a steady defender who could help contenders or retooling teams alike. He’s a perfect candidate for a hockey trade, maybe even in a deal for a player who would otherwise cost the Sabres a first round pick. The rub with McCabe is that he is and has been an effective piece for the Sabres defense corps. He’s a top-four player at the moment and it’s easy to see him as part of the puzzle moving forward. It’s for that very reason he’s a quality trade candidate. They’d obviously miss him but I think he’s possibly the best candidate to move in a deal that would reshuffle the roster while maintaining Botterill’s control over his most valuable draft capital.